The following report represents an expansion of the data collection activities mandated by a 2012 Administration of Intellectual and Developmental Disabilities (AIDD) Funding Opportunity Announcement (FOA). Prior to 2012, the AIDD funded data projects, Access to Integrated Employment, Family and Individual Information Systems project (FISP), Residential Information Systems Project (RISP) and the State of the States in Developmental Disabilities only collected data from the 50 states and the District of Columbia. The 2012 FOA requested that three of the AIDD data projects work together to include the five U.S. Territories (American Samoa and the Commonwealth of the Northern Marianas Islands, Guam, Puerto Rico and the Virgin Islands) in their data collection and analysis efforts. This summary represents the first step to describe the services for people with intellectual and developmental disabilities and their families in the territories. While the information may have limitations in the comparability to the rest of the nation, AIDD believes that it is important to begin data collection, tracking and analysis to increase opportunities to improve self-determination, independence, productivity, integration and inclusion of people with IDD into their communities in the U.S. Territories. Institute for Community Inclusion, RTC on Community Living, and The State of the States in Developmental Disabilities (2015). 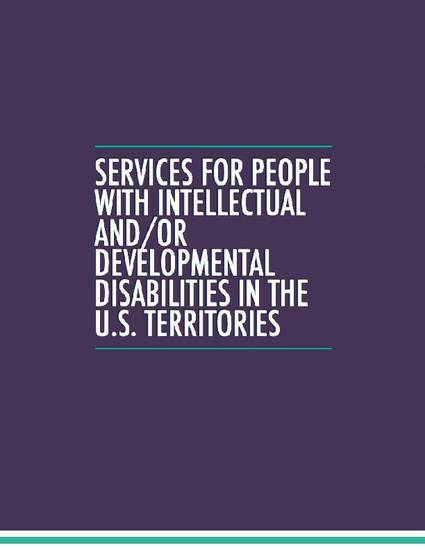 Services for people with Intellectual and/or developmental disabilities in the US territories. University of Massachusetts Boston, University of Minnesota, and University of Colorado.